 This anthology explores the history of environmental racism (the locating of an unfair share of toxic hazards in communities of color) and provides case studies from around the country of blatant discrimination. Bullard, who served on President Clinton's environmental transition team, offers an overview of some early struggles. Among them is the battle that the African-American community of Triana, Ala., faced beginning in 1978 when it discovered that Indian Creek, a local source of fish and water, was highly contaminated with DDT from a nearby plant that had shut down in 1970. Eventually, the town reached a financial settlement, a rarity in such cases. 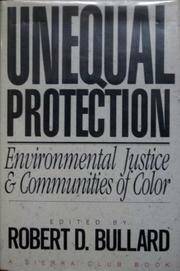 The book also tells of the fight to ban the dumping of PCBs into a landfill in Warren County, N.C., the poorest county in the state; of the development of an African-American neighborhood of Carver Terrace in Texarkana, Tex., on top of an old wood-treatment plant and its subsequent placement on the Superfund National Priorities List; of a lead smelter allowed to pollute the largely African- American community of West Dallas; of the creation of ``cancer alley'' by the petrochemical industry along the Baton Rouge/New Orleans corridor; and of the impact of the energy industry on Black Mesa, inhabited by both Navajos and Hopis. The final section is a call to action and examines some emerging networks and alliances in the environmental justice movement. While the book is a good primer on the movement, its real strength is in the individual community stories. The essays are uneven--some dramatic, some dry--and a few are old and could have benefited from an update (e.g., the Environmental Health Network is now in Virginia, not Louisiana). But despite these flaws, Unequal Protection is likely to be an eye-opener--both to those who are not aware of discriminatory environmental policies and to those who are.